The Reading Station DAPTIQ by STAHLWILLE has redefined asset control. In applications where regular checks for completeness are indispensable, this system provides much improved safety, security and efficiency. It can be linked to ERP systems or warehouse management systems and delivers reliable data on the tools contained in the readable storage system. This also reduces capital investment. 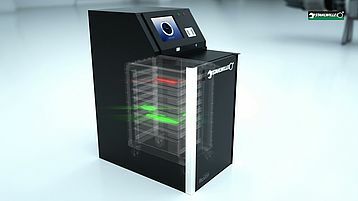 One key reason for this is that, in contrast to conventional systems for monitoring tool trolley content, the Reading Station DAPTIQ system, developed in conjunction with development partner Nexess, allows the greater part of the scanning technology to be centralised. 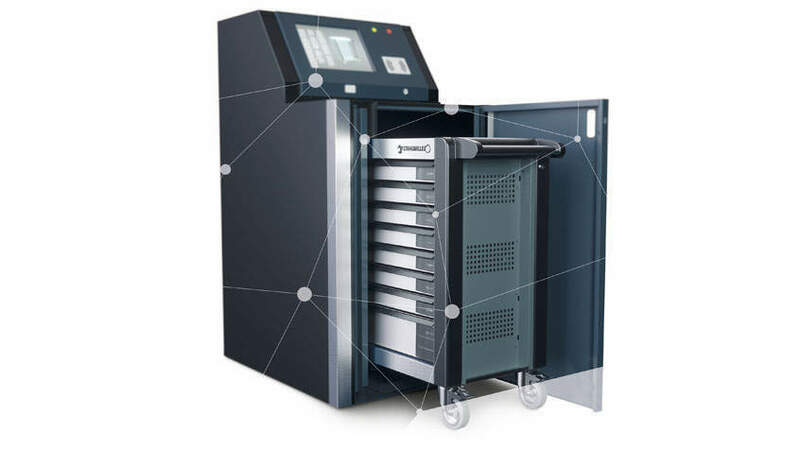 A customer only needs to procure one Reading Station DAPTIQ and it can then be used with every DAPTIQ storage solution. Tool Trolley 95VA DAPTIQ, for example, contains RFID tagged tools but, apart from these, relatively little hardware, which makes it less expensive to purchase in comparison with other tool trolleys with installed content monitoring. A further benefit of the Reading Station DAPTIQ, that is protected by a number of patents, is that the items inside the 95VA DAPTIQ are completely protected against interference signals for the duration of the asset check. Other tools cannot interfere with the tool scanning procedure. And last but not least, this system is capable of scanning and analysing several hundred tools faultlessly within a very short time. The Reading Station DAPTIQ has been designed for auditing a wide range of different sized tool storage and transport solutions. Keeping costs down. In stark contrast to optical detection systems, the arrangement of the tools inside this storage solution can be modified at any time. RFID technology is mature and is recognised as being one of the most secure detection systems on the market. Thanks to the use of small RFID chips, virtually any tool can be monitored. The Reading Station DAPTIQ identifies the tool trolley and the tools contained in it. The results of the scan are immediately made available to the linked ERP or warehouse management system for further processing and logging. Spacious. Easily removable drawers with ball bearing slides. Fully extendible roller-mounted are optional. Smart design. The three-stage locking system prevents toppling, inadvertent opening in transit and unauthorised access. Accessible. Drawers can be opened 100% – enabling unhindered tool access and a clearer overview. Robust. Sturdy construction using high-grade materials to ensure durability.